Last December I traveled to Coimbatore, India for the first time (it was my 7th trip to India). The main focus of my trip was to experience 7 days of rejuvenation at the Ayurvedic Wellness Center Vaidyagrama and to attend the 5th International Ayurveda Conference. Here’s a little about my experience there, plus my recommendations for what to bring, where to shop, and what else to see in Coimbatore, India. My first seven days at Vaidyagrama Ayurveda Healing Center were calm and nurturing. Vaidyagrama is quickly becoming one of the top recommended Ayurvedic healing centers for Westerners, specializing in pancha karma and rejuvenation therapies. In fact, several western practitioners including Dr. Claudia Welch (USA), Myra Lewin (USA) and Rama Prasad (AUS) were visiting and/or doing pancha karma while I was there. The healing center (in India they call them Ayurvedic “hospitals” but they are not similar to western hospitals by any means), is located about 45 minutes outside of Coimbatore city. The Ayurvedic Vaidyas are truly spiritually centered. Every morning and evening there is prayer or pooja for those in residence. The grounds and buildings are eco friendly/green and built according to vastu shastra principles for optimal energy and positive planetary influences. The vaidyas are traditionalists and very mindful of each patients needs. They see patients each morning and treatments are slow and steady. For instance they would not allow me to have a shirodhara treatment during my 7-day stay as they said the mind is only ready for shiro after two weeks into treatment, otherwise it can cause mental disturbance. I appreciated this very conscious perspective. The food is very simple and sattvic – don’t expect too much variety or spice. They feed more than 100 disadvantaged villagers a day! They offer medical Ayurveda camps to disadvantaged villagers. They are teaching their community about sustainable green living and farming. If you are shopping in Coimbatore, don’t miss the Lord Dhanvantari temple located on the edges of the city. The main deity, Lord Dhanvantari is the lord of Ayurveda. Be sure to pay your respects and give gratitude for the beautiful wellness system of Ayurveda. There is also a hospital and cafeteria on the premises. They sell mantra boxes (a small metal box that plugs into the wall and repeats different mantras over and over) as well as Lord Dhanvantari laminated cards, and simple malas. 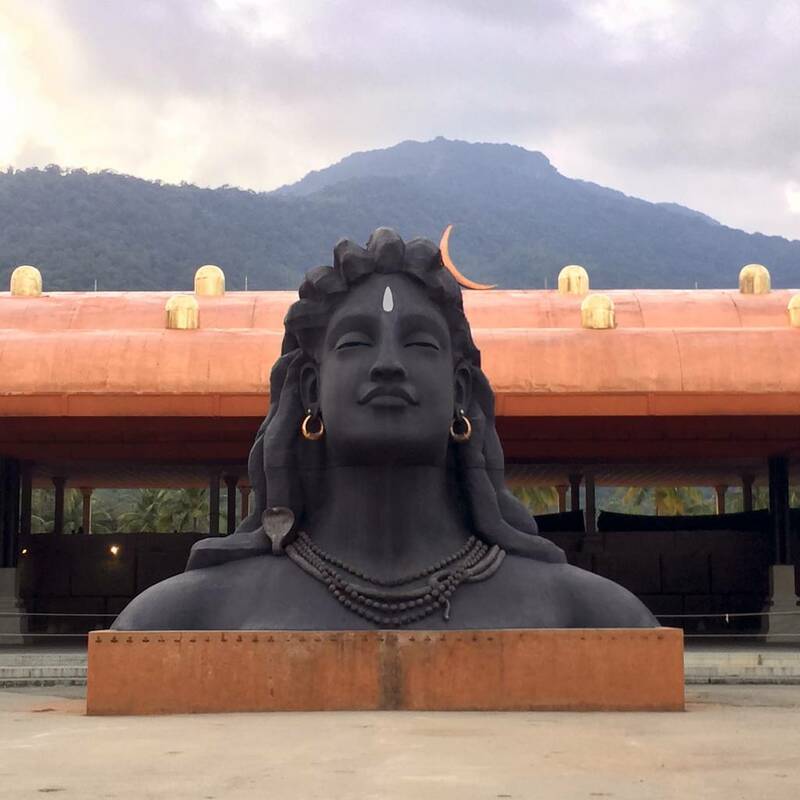 Before the conference started I took a day trip to the Isha Yoga Center. This modern temple center and ashram is stunning and powerful. It took my breath away over and over. The temple was created and is led by Sadhguru. A couple of years ago I discovered Sadhguru’s videos on YouTube and fell in love with this down to earth, wise and funny, enlightened human-being. If you are in Coimbatore, this spiritual center is a must see. Spread over 150 acres of lush land, the center is located at the foothills of the Velliangiri Mountains, set in one of the most scenic parts of south India. “Pristine hills with thick virgin forest, sparkling rivulets and waterfalls and an abundant wildlife make for a stunning backdrop to this powerful site for inner transformation”. The focal point is the “Dhyanalinga, a unique and powerful energy-form sitting under a pillarless 250,000-brick dome structure”. A place to make offerings, pray, meditate and be basked in divine energy. Don’t miss daily activities such as the timeless AUM meditation, and the musical sound bath of vocals, signing bowls, drums, and other beautiful instruments. There is a healing rejuvenation center offering Ayurvedic and Siddha treatments. You can take a day trip or choose to stay overnight for a retreat in their comfortable and nicely designed cottages. They offer weekend retreats, monthly residential programs, and even opportunities to volunteer at the center. Great shopping and vendors selling clothing, music, housewares, spices, incense/pooja items and more. The main reason for my trip to India was to attend the 5th International Ayurveda Conference organized by Punarnava Trust. The conference was previously held in Rishikesh and 2015 was the first year it was held in Coimbatore, next-door to Vaidyagrama Healing Center. The conference is held every two years; the next conference will take place in Coimbatore in 2017 (likely December). 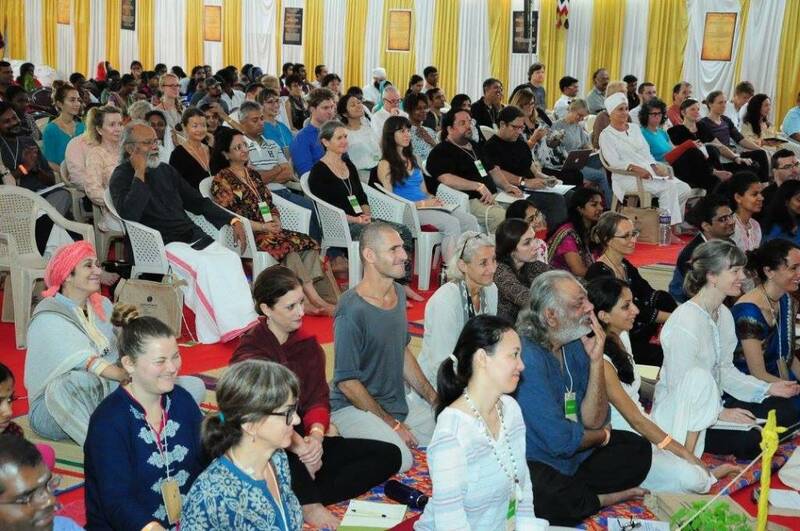 The event brings together a beautiful global Ayurvedic sangha, or family – inviting both Western and Indian presenters and attendees. It was very special to attend an Ayurveda conference that intends to harmonize the east and west, despite differences that will always remain. The majority of the western delegates were from Australia with Americans and Europeans also in attendance. Core supporters and western speakers include: Vasant Lad, Dr. Claudia Welch and Robert Svoboda, Rama Prasad, Myra Lewin, and more outstanding teachers and Ayurvedic leaders. Each morning and evening a group of Vedic priests perform the most inspiring and powerful spiritual ceremonies/poojas that include music, chanting, fire, and sacred art and offerings. I lost track of myself, and hopefully burnt some karma during these sacred and once-in-a-lifetime ceremonies. The conference setting was real and authentic India, not held in a hotel, the conference rooms were made of locally built structures of bamboo, sheet metal and palm leaves, portable toilets are used (if you plan to attend a future conference, consider bringing hand sanitizer), and a giant cafeteria built for feeding the near thousand people that attended. Housing was also non-traditional and rustic; I hear they are working on improving housing for the western attendees. There is an evening entertainment performing arts show performed by local talent including authentic cultural dance and music. One night a group of westerners organized a group kirtan and invited all to join in. Coimbatore is located in southern India in the state of Tamil Nadu. The weather can get HOT, fortunately Mother Nature provides abundant coconut groves and one can find plenty of opportunities to stop for a cooling drink of coconut water. The cooler months are December through February averaging in the 80’s. Pack a hat as you feel the burn on the top of your head, even in the cooler months. In general, you can find just about anything you would want to buy in Coimbatore, from statues, to spices, clothing, and Ayurvedic medicines. Pothy’s Department/Grocery Store: Similar to an Indian Target, here you can buy spices, snacks, kitchen items, pens, mantra boxes, etc. Vasan Eye Center: Clean, high-tech affordable frames/lenses designer glasses and $1 Exam. Bring cash. Fab India: Indian Clothes catering to westerners, Home Goods, and Organic India herbal products. Be sure to stop at the small “photo/print” shops in the city center for some great deals on Vintage and tacky deity images. I picked up two for $2 each. The shop owner where I bought my prints was thrilled beyond measure. I spent a total of $6 and it made his week (or month). Bless him. And don’t forget the great shopping at the Isha Yoga Center. They sell clothing, unique jewelry, spices, CDs/DVS, books, and even some high-end home-goods and furniture. The State of Tamil Nadu is famous for its deep belief that serving food to others is a service to humanity, as it is common in many regions of India. The region has a rich cuisine offering both traditional vegetarian and meat dishes. All meals are centered on rice, lentils and legumes. Food is flavored with spices including curry leaves, mustard seeds, coriander, ginger, cumin, garlic, chili pepper, cardamom, cloves, coconut and Tamarind as the preferred sour flavor. Many meals are also served with slices of amla fruit. A basic meal includes a thin tomato based vegetable soup/gravy called sambar, various rice dishes and chappati. Dosa with chutney and sambar are the basic “fast food” of the region. The traditional way of eating a meal involves being seated on the floor, having the food served on a banana leaf, and using the clean fingers of the right hand to transfer the food to the mouth. After the meal, the fingers are washed, and the banana leaf becomes food for cows. Women should wear cool yet modest clothing covering shoulders and neck. Bring a light scarf or two to carry with you. A sarong can be used as a towel when needed, instead of packing a bulky towel. You can also put this under your ankles when sitting on the floor (my ankles always burn when I attempt to meditate on a hard floor). A donut neck pillow can be used on the plane and later can be used to increase your comfort level anytime you will be sitting on the floor. Arnica to prevent jet lag. Take every few hours on the plane and the few days before and after flying. Melatonin helps to adjust to the new time zone. Banyan Botanical’s “I Travel Well”, a great all-around formula for supporting the immune system and digestion. Extra Triphala to help maintain a regular bowel movement. You may want to combine with ghee if you are extra constipated. Grapefruit seed extract helps prevent and treat infections caused by viruses, bacteria, funguses and parasites. It also helps alkalize the body. An anti-parasite formula to ward off unwelcome creatures from taking over your gut (it’s happened to me twice – yuck). Take this during the trip and for two-three weeks after the trip for prevention and treatment. Upa Yoga is a set of simple movements that activates the joints and enlivens the body and mind. It’s a perfect exercise when traveling long distances and may assist with symptoms of jet lag. Erin Douglas is a spiritual traveler and karma yogi who loves to connect with other people and communities around the globe in deep and meaningful ways. Erin is co-founder of the Learn Grow Lead, a non-profit that focuses on developing & supporting sustainable income generating projects that benefit disadvantaged youth in developing countries. Erin lives in Ashland, OR with her Cairn terrier dog, Bucky, and is a super devoted Aunt to her twin sister's kids. She works at Banyan Botanicals on the Community & Customer Relations team and she is an Ayurvedic Wellness Counselor. Very nice to read your synopsis of your trip ! Glad to hear about the conference (I would have love to attend !) as well as your visit to the Isha Yoga Centre. I have spent time in both Vaidyagrama and the Isha Centre for several months. Erin, This article is fabulous and so timely. I am looking forward to going to Vaidyagrama next week after meeting Dr. Ramkumar 9 years ago at his first Ayurveda (Ayurveda & Consciousness) Conference in RIshikesh. I appreciate all your suggestions, even though our plan is to do less, and rest more. Jai Ma, my love! Lovely share Erin – it is a phenomenal place!